Two-and-a-half years ago Cleveland-based Business Volunteers Unlimited (BVU) and Akron-based Center for Nonprofit Excellence (CNE) merged into one organization, BVU: The Center for Nonprofit Excellence. Looking back, this was a positive step for our organizations due to the strengths of each. Although the merger process was not easy, we are enjoying the fruits of a vision led by our boards. The CNE board reached out to BVU’s board to get the ball rolling. A small task force of both boards and senior staff drove the process by openly discussing any roadblocks. Because of its success, we have been asked to speak on the subject and help other organizations through the process. Many community leaders want to see mergers happen but sadly they are a rarity. Why are boards and staff resistant to explore options? The Chronicle of Philanthropy published an article last month, “Mergers Might Happen More Often If Nonprofits Focused on Workers’ Needs,” authored by Katie Smith Milway and Maria Orozco. This article gives valuable insights to what we have seen. While the Great Recession of 2011 led corporations to pursue mergers at a fast pace, the nonprofit world did not follow suit. They cite two facts: 1.) 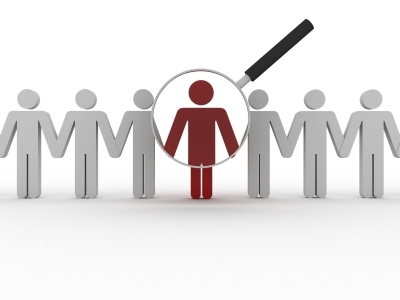 Few organizations exist to make matches between prospects, and 2.) Little money is available to ensure that the senior staff have financial incentives in that they may lose their jobs. In 2009, Denise Zeman, President & CEO, St. Luke’s Foundation, and Deborah Vesy, President & CEO, Deaconess Foundation, invited 80 nonprofits in Northeast Ohio to discuss the spectrum of collaborations. They were concerned about the decreasing availability of dollars from funders and the need to consider alternatives, one of which is mergers. These foundations offered to provide consulting support to nonprofits interested in exploring collaborations. The foundations’ leadership opened dialogue on a sensitive topic which resulted in three mergers and one consolidation. However, since then it has been quiet. Why the unwillingness to open this type of discussion? Is it the loss of leadership roles for board and staff? The daunting amount of work? Anxiety in negotiating with funders to prevent cuts in funding when two entities are combined with no loss of services? Founders’ (board and staff) lack of flexibility? Name, mission, and branding of the new entity? All are emotionally charged issues. An unwanted outcome is that mergers could be reactive due to a depletion of cash reserves and lack of capacity — rather than being a proactive step. In the next 10 years, hundreds of baby boomer nonprofit chief executives will retire. This is an opportunity for new leadership to consider a merger or collaboration. When conducting strategic reviews, we must always ask the question, “Are there better ways to advance our mission by working with another organization? If so, what are the possibilities in aligning ourselves more effectively?” It is up to the board and chief executive to determine if it a merger or collaboration is warranted. Remember that the act of an initial investigation does not equal commitment to moving forward. 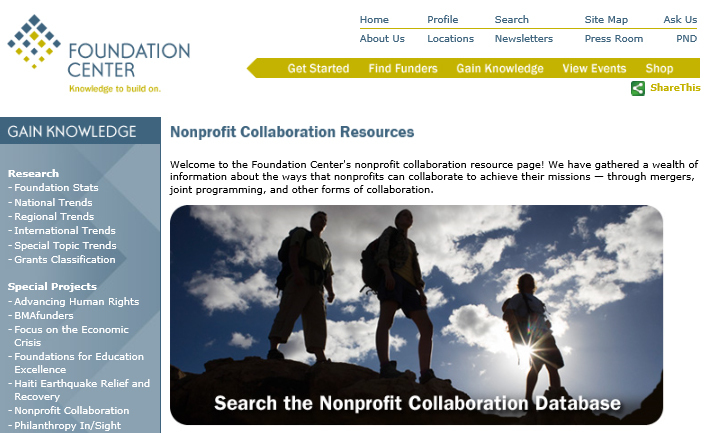 The Foundation Center’s nonprofit collaboration resource provides a wealth of information on nonprofit mergers, joint programming, and other forms of collaboration. Considering a merger or collaboration? Where do you start? Best practice is to look at complementary organizations serving different geographies or finding a continuum of services that could be expanded with the same constituency, with both leading to savings in administrative costs. There are three stages of review. 1. Feasibility – looking at the ‘fit’ of mission, service offerings, board structure, staff organization, geographic reach and culture. 2. Due diligence – financial sustainability, HR policies and benefits, by-laws, etc. This is where the attorneys and accountants need to be involved. 3. Pre and post-merger integration – all of the steps that help the board and staff to integrate. BVU and CNE addressed 66 integration steps. Although daunting at the time, our merged organization has supported us in growing and delivering on our mission. A valued, but unanticipated, outcome has been the respect of the community. This entry was posted in Leadership, Nonprofit Boards, Nonprofit Management and tagged collaboration, Governance, merger, nonprofit, nonprofit boards, Nonprofit organization on April 15, 2014 by BVU: The Center for Nonprofit Excellence. The February 28th issue of The Chronicle of Philanthropy featured an article titled, “Nonprofits Go All Out to Find and Recruit Stronger Board Members.” In the article, a number of tips are suggested for how nonprofits can build their boards to more effectively serve their missions. FIRST — Determine your ideal board composition based on the important work your organization is undertaking right now. What are the skills, constituent representation, diversity, access to resources and networks that you need to accomplish your work? For example, if you are an organization that focuses on helping young people be prepared for the workforce and higher education, you would probably want to ensure that you have business professionals in those industries as well as representatives from higher education so they can help you keep your programming and services relevant. Identify the gaps so you know what skills and attributes you’re seeking. 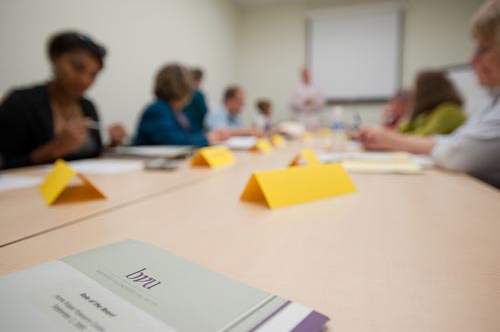 NEXT — Use your networks to develop a list of potential board members to contact. You never know who is out there who might have a passion for your work and the skills to help you advance your mission! Ask board members to suggest individuals who meet the needs you’ve identified so that your Board Development Committee can reach out to them. Professional associations, universities, and young professionals’ groups can all be resources as well. And of course, we would suggest that you contact BVU regarding our board matching services. We learn about your needs and then play “matchmaker” to try and find candidates from Northeast Ohio businesses that fit those needs. Our process is painless for the nonprofits and can be another resource for you as you build and refine your board over time. AND THIRDLY — Be very open in your conversations with potential candidates. Invite them to coffee or for a tour of your facility and have a very candid conversation with them about the organization and what’s going on, how their skills/background fit into what you’re looking for, and share a full overview of what you expect out of board members. LASTLY — Once you have individuals “on board,” be sure and provide a full orientation and continued ongoing education about your organization. Maybe even have them “buddy up” with a current board member who can guide them along through the learning stage as they join the board. The “care and feeding” of board members (potential and current) is serious business. Building the board is one of the most important duties of board members, and done right, can immensely impact the effectiveness of your organization. This entry was posted in Leadership, Nonprofit Boards, Nonprofit Management and tagged akron, board matching, board recruitment, Cleveland, nonprofit boards, northeast ohio, stronger boards on March 13, 2013 by BVU: The Center for Nonprofit Excellence.